10 years on and we reflect on the campaign to oppose the relocation of Melbourne’s Museum from the city center to the Royal Exhibition Buildings, Carlton Gardens. The State Museum in its current site is struggling to attract visitors and is in financial difficulty. The Museum will soon need to expand but has no where other into the park to go. The predictions and concerns of Trevor Huggard, Miles Lewis, myself and others have been proven right. It was 10 year-ago when Peter McMullin, Ivan Deveson and Rob Adams sold out their integrity under threats by the then Premier of Victoria, Jeff Kennett, to back off from supporting the campaign to have the museum relocated back into the city center. Peter McMullin lost the Deputy Lord Mayors post the following year and failed to be reelected to council in 1999 and 2001. Ivan Deveson lost support and did not stand for re-election in 1999. Rob Adams is still with the City Council but with his reputation stained as a result of his actions. The Age, the Herald Sun and the people of Melbourne all expressed opposition to the proposed development. In 1999 Jeff Kennett lost office. We called it, simply, ‘the dome.’ We saw it every day, as we made our way from our single-fronted terrace, in Canning street, the three blocks south, to Lee Street Primary school. It was a constant in our lives, the southern boundary of our childhood world, distant, but clearly visible, especially from the open road, where we rode our scooters, raced our bikes, got up to no good, and played epic cricket matches between the Canning and Amess street boys. The dome: In summers it seemed to shimmer in the crackling heat. On foggy mornings, it emerged, triumphant, from the mists. In late spring, when the poplars on Canning Street regained their leaves, it rose above an avenue of vibrant foliage. The Exhibition Buildings was the first wonder of our childhood world. It was majestic; free standing and unobscured, in a parkland setting. Its Florentine dome overlooked flower beds and shaded paths. It was our grand landmark, our neighbourhood icon. Sometimes we made it inside, under the dome, lured there by the latest show to come to the Exhibition Building. We were engrossed in collecting glossy brochures, and viewing the vast array of cars, boats, camping gear, or whatever, that crammed the exhibition halls. Just occasionally we glanced up and sensed the grandeur of this cavernous wonder, with its maze of galleries and arches, sumptuous ornamentation and towers. As we grew older, the inner city skyline became more hard edged. Curves and church spires were dwarfed by rectangles and right angles. High rises cluttered the skies. Even then, the dome was still visible. Reduced in scale somewhat; but all the more precious, because it defied the times. It was a constant reminder that there are other possibilities. Other visions. Other ways to design a city. The Royal Exhibition Building, the dome, and the Carlton Gardens, are now facing a far more lethal threat. In a decision that was made with no public consultation, no impact studies and no historical advice, the new Museum of Victoria lost its half-completed building on Southbank, and is to be built, instead, in the Carlton Gardens. More disturbing is the brief for the museum design, which states, ‘it is also inevitable that at some time in the future additions to the complex will be required. The building needs to cater for expansion in both its internal planning and its external appearance.’ So the new museum may well pave the way for further intrusion into the Carlton Gardens. This is far more than a local issue. The Exhibition building is a major part of our nation’s heritage. It was built to house the Great International Exhibition of 1880-81. It was the venue of the Centennial Exhibition of 1888. The first Federal Parliament of the Commonwealth of Australia was opened here, in May 1901, with much celebration and ceremony. And it remains, along with the Eiffel Tower of Paris, one of the few structures that were built in the nineteenth century era of great exhibitions. 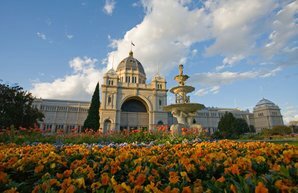 The Royal Exhibition building is a Victorian icon, and a national treasure. Trevor Huggard, former Lord Mayor, is lobbying the council to nominate it for World Heritage Listing. It is, according to Miles Lewis, the only building in Victoria with any prospect of achieving such an honour. This would mean a lot in terms of tourism and prestige. In fact the building is well placed for such as listing because in the 1980s it was restored to its 1901 concept of colour, design and art decoration. A group of Melburnians who are enraged by this decision, are still trying, desperately, to get their message across. They first called their group, Defend the Dome. As the issues have broadened, they have renamed themselves, Defend our Heritage. Spokes-people like Anthony van der Craats, Mary-lou Jelbart and Trevor Huggard, continually point out, there are a number of far more preferable sites for the new museum, such as the vacant CUB site, Queen Victoria site, or the former police head quarters in Russell street. Building the museum on one of these sites, would help the inner city revive. It would place the museum where it belongs, as part of the cultural spine of the city. And it would be a boon city businesses in the CBD, already in decline as the focus shifts to the casino complex on Southbank. Inner city businesses face a loss of revenue from a projected one million annual visitors to the new museum. It is only once in a life time that the opportunity comes to create a great new building for this purpose. Melbourne deserves a world class museum, where it belongs, in the heart of the city. It is not too late to reverse this decision. The cyclone fences have gone up. The bulldozers are at work. But the contracts for the building have not been finalised. This is written as a plea to the premier, his government, his planning minister, those who hold the reins of power, that for the sake of our city, for the sake of future generations, stop, rethink, take a look at what you are doing. You are destroying a place of grace and grandeur. You are destroying the peaceful ambiance of its surrounds. You are destroying the work and vision of our collective past. You are destroying aspects of our common heritage. Yes, our heritage. At the same time, you are consigning the new Museum of Victoria to the city fringes. Stop it before it is too late. Institute a stay of execution. Set up a process of genuine public consultation and review. Allow the broader community to be informed. And, above all, spend some time in the gardens to absorb its serenity. Walk the road that leads to the dome, and contemplate what you are about to do. It is so obviously wrong. Arnold Zable is a Melbourne based writer. In the 1970s he taught a course in urban and environmental politics at Melbourne University. We have a state government that loves to congratulate itself on its great works, and on the way it is transforming the city. But the reality is, that it is intruding into our parks and gardens, making crucial decisions with little consultation, and without regard to overall strategic planning. And in the process it has left a lot of people feeling powerless, disenfranchised and unwilling to speak out. The article by Arnold Zable printed above records a significant turning point in the history of the Royal Exhibition Buildings in Melbourne and it’s nomination for World Heritage, the development of Melbourne’s Museum and the campaign to have the Museum of Victoria relocated. It records part of the missing chapter in the history of the Royal Exhibition Buildings written by David Dunstan, historian. IN 1996 a meeting between John Brumby, former leader of the Victorian State opposition, Trevor Huggard, former City of Melbourne Lord Mayor and Exhibition Buildings Trustee, Sigmund Jorgensen, Montsalvat Arts Foundation and Anthony van der Craats, Carlton Resident and community activist, took place in the Victorian State Parliament to discuss issues of concern and opposition to the then proposed development of Melbourne Museum adjacent to the Royal Exhibition Buildings. It was at this meeting that John Brumby first proposed and supported the listing of the Royal Exhibition Buildings on the World Heritage List in hope that the nomination would cause Jeff Kennett, Premier of Victoria 1992-1996, to rethink the proposed development of Melbourne’s Museum in the Carlton Gardens. At the time Jeff Kennett opposed the World Heritage Listing. In 1979 history has recorded that Jeff Kennett, as a Liberal State Minister, proposed the demolition of the Royal Exhibition Buildings. Whilst he managed to demolish the Royal Ball Room he was unsuccessful in his desire to see the Royal Exhibition Buildings demolished. The National Trust’s expert building committee opposed the design and development of Melbourne’s Museum citing that the development was not in keeping with the scale, design and significance of the site. Dr Miles Lewis, Architectural Historian and member of the National Trust’s historic building committee express serious concern at the failure of the Kennett State Government to subject the proposed development to a proper planning process and assessment. The Board of the National Trust, who had an on going business relationship and close association with the Museum of Victoria, overturned, to the dismay of it’s members, the recommendation of the Trust’s expert committee. In December 1996 Anthony van der Craats, was elected to the Board of Directors of the National Trust of Australia (Victoria) in opposition to the determination of the Board to overturn the recommendation of the expert committee. He served as a Councillor of the National Trust for three years until 1999. He was later joined by fellow activists Julianne Bell and Mary-lou Jellbart both who were elected to the Board of the National Trust in 1997 and 1998 respectively. Whilst the community campaign to stop the Museum development in 1996 was unsuccessful, John Brumby, who later became Victoria’s Treasure in late 1999, recommended and approved the nomination for World Heritage Listing. The Royal Exhibition building is Australia’s first building to listed for World Heritage. There continues to be ongoing concern and issues related to the Museum which was built adjacent to the Royal Exhibition Buildings prior to the World Heritage Listing. The following persons deserve recognition for their contributions for the preservation of this magnificent historical Melbourne Icon. Carlton Community who have been its protector and neighbour without whom the Carlton Gardens and the Royal Exhibition Buildings would not exist today.